Probably, right on the headline you just got stuck, because it looks weird. What’s a ChatSim? We have heard about U-SIM, Mini SIM, Micro and Nano SIMs, but what’s that? A new kind of SIM or just something else? 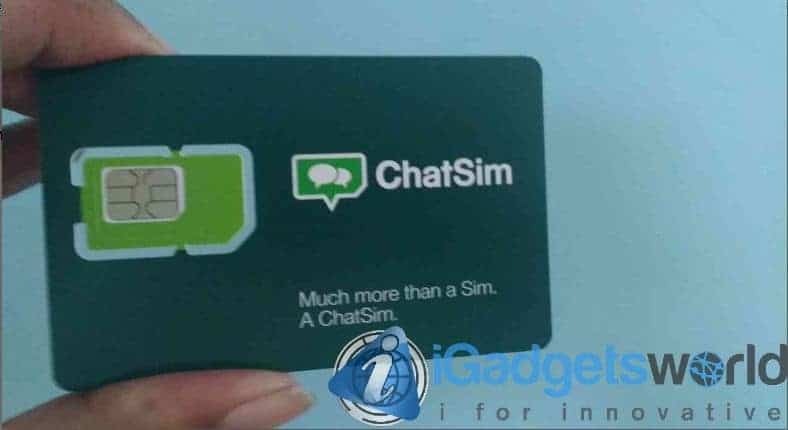 Actually, ChatSim is a kind of SIM card that’s one of its kinds in the world, because it lets you stay connected to everyone, anywhere in the world, without having to pay extra data charges and expensive international roaming plans. How? Let’s find out. ChatSim is an SIM card and also the world’s first instant messaging mobile operator. Sound crazy? yes, actually Manuel Zanella, had got the idea of creating an SIM that is intended just for messaging, no calls or SMS, just pure pleasant chatting experience that you can get. He is also the CEO of ChatSim and founder and CEO of Zeromobile, which is Italy’s first Global Mobile Operator for low-cost roaming. And behind this idea, lies the realization he had about the future as IMs are now too mainstream and people use instant messaging apps like WhatsApp, WeChat, Hike, Telegram etc. a lot more than conventional SMS and we have already been watching that change. “Not only are Instant Messaging Apps more practical and immediate, but they are also less data traffic intensive because text messages and emoji use very few kB, a lot of hard work went into creating ChatSim World to implement this innovation and to make it a more efficient and better-performing version of ChatSim and ChatSim Plus, an SIM card designed specifically for chatting cannot afford to let other apps waste data traffic. This is something that should never happen anyway in the interest of users,” explains the ChatSim CEO Manuel Zanella. “Not everyone knows that a substantial amount of data traffic on mobile devices is generated by apps even when they are idle. ChatSim World is the ultimate solution to this problem. With a sophisticated firewall system, all non-instant messaging are automatically blocked.” He stressed a lot on the data saving that ChatSim offers. Sounds cool, huh? He also mentioned that people need to pay a lot extra while travelling abroad, as they need to pay almost twice as compared to the normal usage as a lot of data is wasted. For them, ChatSim World is a great companion and a value for money product and don’t worry about the data connection speed. While you are travelling to Belgium, Canada, South Korea, France, Germany, Ireland, Luxembourg, United Kingdom and Spain, you can surely get 4G LTE otherwise you will get 3G in rest of the countries. However, they are also planning for extending the agreements with various careers across the globe to provide ultra-fast 4G connectivity. Now, probably you might be thinking about the catch here, but actually there’s no catch in this. You just need to pay €10 and you can chat for free and with no limits at all, and can exchange text messages and emoji for a year. It’s actually quite easy and extremely fast, as far as I have experienced. You just need to head over to [eafl id=13636 name=”Buy ChatSim” text=”their official website”] and click on ‘Buy Now‘ then you will be prompted to select your plan and the features that you want to use. For one year of free text messaging and emoji’s you need to pay just €10, however, you can add additional multimedia credits for sharing photos, videos etc. They deliver really fast and have different shipping options. While you receive the SIM just you need to visit their website again to register. There you just need to enter your SIM number and serial number. Then, you just need to fill out your personal details and upload a copy of identity proof for verification. The process is swift and I got my ChatSim activated within one hour. And yes, I’m enjoying it? So, tried having a little fun with Vamsi. A value for money or just like any other SIM? If you don’t bother much about Facebook and Twitter updates, and other social media often and just want to focus on chatting on the go with your friends, ChatSim is definitely a very good choice. Or else, you may end up frustrated if you don’t buy a multimedia pack separately. Also, the ChatSim World, which I have been currently using is a great tool for you if you travel abroad pretty often but don’t wanna miss any of your friends or relatives and just wanna stay connected. ChatSim World, ChatSim Plus and ChatSim all are different variants with different pricing and features and you are the one who will buy one, so just go through their website to know what they offer in different packages and pick the one that suits you best. Hope you will enjoy using this small tool along with your primary SIM card.